This photo, taken by Annie Spratt of the UK, was later amended with the words u201cMake America Kind Againu201d and was proliferated via blogger Adam Rifkin, striking a chord with many during times marred by incivility. 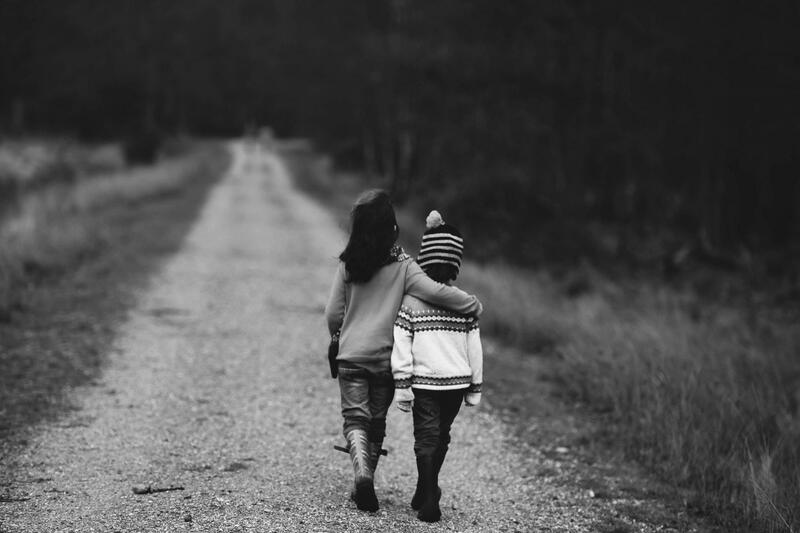 ecently, there was a moment of promise when a black and white picture of two young kids — an older girl, maybe 10 years old, with her arm around a smaller child — walking down an unpaved rural road appeared on my Facebook timeline. The text that accompanied the picture read, "Make America Kind Again." As a journalist and historian, I don't often live in some nostalgic wonder space believing that America was ever wholly kind. We are, after all, a nation that lives daily with the legacy of slavery, Civil War, segregation, and an ever-present polarization that was used to strike a balance of power, consent, and the masquerade of reconciliation. Nevertheless, we are not bound by those underpinnings. We have striven to be better. Martin Luther King, Jr. reminded us in his "Letter from a Birmingham Jail" that "we are caught in an inescapable network of mutuality, tied in a single garment of destiny. Whatever affects one directly, affects all indirectly." That idea of mutuality led many in this country, both before King's time and after, to pursue a basic kindness and a basic civility. Something that would endure the perils of politics and the cults of personality from which such perils are born. But today that kindness and that civility seem more distant than many of us can remember. Among many episodes of incivility, our President — who has also called a woman a "Horseface," mocked a person with a physical disability, and speaks only in probabilities about the assassination of a foreign journalist — recently celebrated Montana Congressman Greg Gianforte, who pleaded guilty to assault in 2016 for body slamming a newspaper reporter from the Guardian. "Any guy that can do a body slam," Trump said, "he's my kind of guy." This came just days after the Republican candidate for Pennsylvania governor took to social media to threaten that he would stomp on the face of incumbent Governor Tom Wolf with golf spikes. Trump's comments seem to have cost him nothing. Wagner's tirade likely ensured that he would lose a race in which he's already trailing badly. But both episodes call to memory the story of South Carolina Representative Preston Brooks beating Massachusetts Senator Charles Sumner half to death with a cane on the floor of the U.S. Senate in 1856 after Sumner had admonished a relative of Brooks' during a speech opposing the expansion of slavery in the United States. Those days, we thought, were behind us. However, we need to be sure that the words of our leaders don't serve as consent for such behaviors among citizens with more in common than we are led to believe because, as King observed of the radical factions in his movement, their rhetoric can carry the tone "of bitterness and hatred, and it comes perilously close to advocating violence." It has been said before that America need not be made great again because it has always been great. At the very least, the idea of America pointed us toward greatness even if our actions did not always move us in that direction. Casting a ballot is the apex of the great American idea. It empowers us to make decisions about who controls the conversation, if only for a few years. It empowers us to choose civility over bitterness and hatred. And it empowers us to choose kindness over violence. As Florida gubernatorial candidate Andrew Gillum so eloquently said in the closing statement of a recent debate, "we have an opportunity on November 6th to vote as a collective ... to say we deserve better, we want better." Let's make America kind again.